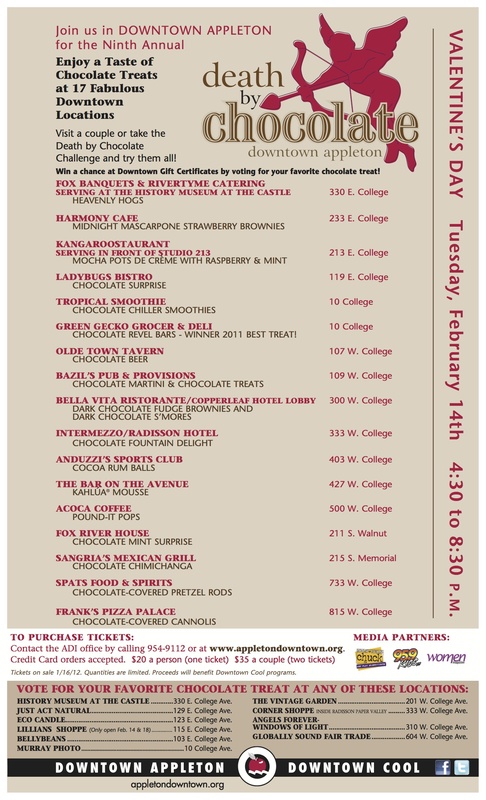 Posted on Feb 5, 2012 by Appleton Downtown Inc.
Join us in Downtown Appleton for the 9th Annual Death By Chocolate! Enjoy a taste of chocolate treats at 17 fabulous downtown locations. Visit a couple or take the Death By Chocolate Challenge and try them all. Win a chance at downtown gift certificates by voting for your favorites. Visit our Death By Chocolate website page for more chocolatey details. Anyone wanna sell 4 tickets?? I see its sold out, bummer.